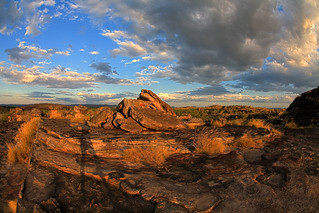 A picture of Earth; Ubirr Rock, Kakadu National Park. In our journey out from the Sun we've passed hot, barren Mercury, covered in impact craters and flitting furtively around the Sun. Further out we passed Venus, shrouded in thick, choking clouds - a lesson in just how badly a planet can go wrong, at least in terms of hospitability to us. The next planet is an altogether different story, because it's the one on which we live. Earth. From the beginning of human history, Earth has been a special place, different to all the other planets. Indeed, for a very long time it wasn't recognised that Earth even was a planet. This is because of our unique viewpoint, living on its surface. Earth is a very special place. As far as we know, it is possibly the single most special place in the entire universe, one where life has begun and evolved. That specialness may be illusory, and vanish as we unveil our ignorance of the existence of life elsewhere, but for now we remain alone. 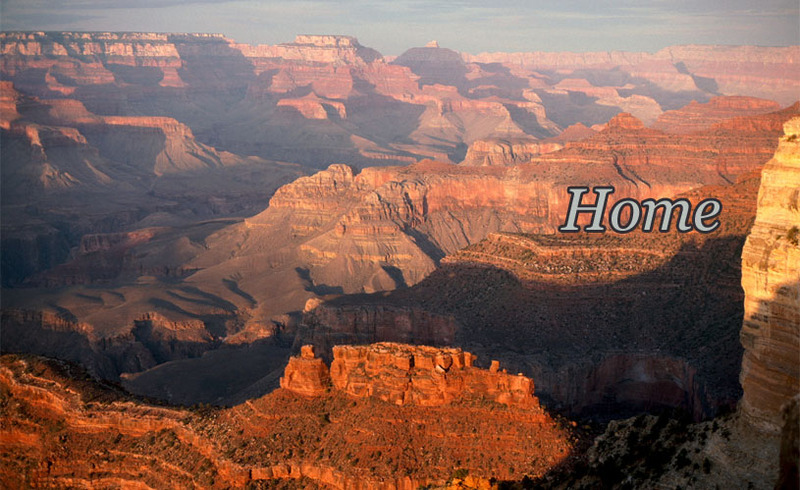 Earth as a place of human habitation has a long and convoluted history. But Earth as a planet has a history not too different from those of Mercury and Venus and the other planets huddled around our Sun. All the planets were born in the same extended event, coalescing over millions of years from the cosmic dust and debris that swirled around the forming Sun. Earth has a typical sort of mass and composition for planets in the inner part of the resulting solar system. A ball of iron and silicate rock, with a bunch of other chemical elements thrown in for variety, and an atmosphere that initially consisted of nitrogen, carbon dioxide, and hydrogen compounds, much like the atmospheres of the other planets. The different thing about Earth is its distance from the Sun. Closer in, like Venus, and Earth would absorb more solar radiation, resulting in higher surface temperatures. At some point, the temperature would be high enough to boil water, which would mean no oceans or lakes or rivers. All the water on Earth would be vaporised into the atmosphere, which would act to trap even more heat on the surface, leading to what's called a runaway greenhouse effect, and the final temperature and pressure would be something approaching the stifling hell that is Venus. On the other hand, if Earth was further away from the Sun, it would be cooler. Beyond a certain point, all the water on the surface would freeze. Again, no oceans, lakes or rivers. No water cycle. 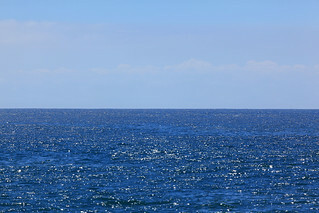 A more typical picture of Earth; Pacific Ocean. Earth is in what the MythBusters would call "the butter zone", and what some astronomers call the habitable zone. A surface temperature that allows water to exist as a liquid (and butter to exist as a melt-in-your-mouth solid) is unusual for a planet. That water covers much of Earth's surface. In fact, as pointed out by Carl Sagan, if any extraterrestrial beings visited our planet (and understood our language), they might wonder why we call it "Earth" instead of "Water". 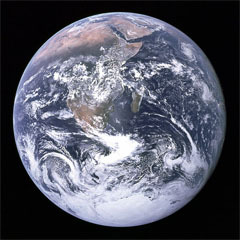 Almost 72% of Earth's surface is covered with oceans, and roughly another 3% is covered by snow and ice - frozen water. That leaves only about a quarter of the surface of the planet actually consisting of rock or "earth". The consequence is that water is available as a solvent for all sorts of interesting molecules, allowing them to get around, mix together, and produce complex organic compounds. For many years we thought that being in the habitable zone was a prerequisite for a planet to develop and sustain life (hence the name). But recently we've discovered and realised that there are plenty of other places within our solar system where life could almost certainly survive, and where it may potentially have begun. Still, until we find some evidence of extraterrestrial life, our planet remains unique in this way. And life itself has also contributed to making Earth unusual, even discounting the existence of intelligent life such as ourselves. The early atmosphere of our planet was very different to what it is now. If you were standing on the surface of Earth around 3 billion years ago, you would quickly asphyxiate to death, since there was no breathable oxygen in the air. As mentioned above, the early atmosphere of Earth consisted primarily of nitrogen and carbon dioxide. All the oxygen was bound chemically into the carbon dioxide, surface water, or into the rocks. It was in this state that the earliest life began, consisting initially of anaerobic bacteria and archaea, which needed no oxygen to sustain their life processes. Eventually photosynthetic organisms evolved, using the energy of sunlight to break apart molecules of water and carbon dioxide to build sugars and other organic molecules, releasing oxygen in the process. 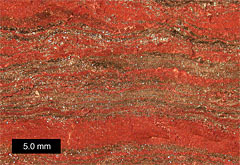 Banded iron formation in rock sample. Public domain image from Wikimedia Commons. The amount of oxygen present in the atmosphere in these ancient times can be measured by examining the layers of rock and minerals laid down by geological processes over the billions of years of Earth's existence. The upper layers of the Earth's surface contain a lot of iron, and iron is good at latching on to any available free oxygen, combining with it to form iron oxide - what we commonly know as rust. Iron oxides have a distinctive red colour (in fact, they are what gives our neighbouring planet Mars its red colour), and can easily be recognised in layers of rocks. The distribution and relative proportions of iron oxide and unoxidised iron in ancient layers of rock allows us to gauge how much oxygen there was in the atmosphere at any given time in Earth's history. It turns out that up until about 2.4 billion years ago, there was virtually no free oxygen in the atmosphere. Around this time, the photosynthetic organisms appeared, and started pumping oxygen into the atmosphere. The immediate effect was that iron in the rocks started absorbing the newly available oxygen, producing vast layers of iron oxide deposits, known as the banded iron formations. This kept the oxygen levels fairly low, around 1% of the atmosphere, for a long time, as the iron kept absorbing the newly created gas. Eventually - and this is a part of the story where the details have not yet been fully figured out - the rocks could no longer absorb any more oxygen, and the gas began to build up in the atmosphere, eventually reaching the level we see today, around 21% of the atmosphere, at which it is held relatively stable by interaction with living organisms. Now this is cool in itself. But think about what it means in terms of planets in general. Oxygen is a highly reactive element. We see this in events like fires and explosions, in which it combines furiously with other elements to form oxygen compounds. It also does so more slowly with metals, producing rust and corrosion. If the oxygen in our atmosphere weren't continually being replenished by the action of plants, it would, over thousands or millions of years, combine with other elements and vanish from our atmosphere again. Free oxygen does not exist in any other planet's or moon's atmosphere in our solar system, and that's not just a coincidence. For oxygen to exist in an atmosphere, there must be life on the planet, continually producing the gas. 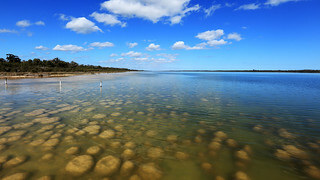 Thrombolites, similar to stromatolites, matted accretions of bacteria. These are similar to what may have produced Earth's oxygen atmosphere. Science fiction notwithstanding, there are not likely to be a very high proportion of planets in the universe which have atmospheres that we could call "breathable", and walk around on without a sealed environment suit. And any planet that does have a breathable atmosphere (or even one with any oxygen at all) will have life on it. At least the equivalent of photosynthetic bacteria or plants. Now think about the current search for planets circling stars other than our own Sun. Twenty years ago, we didn't know of any such planets. Now, we have catalogued close to a thousand. They have been detected by various clever indirect means, but new telescopes coming online very soon will start having the capability to detect these planets by imaging them - actually capturing light coming from them. And if we can capture light coming from a planet, we can analyse that light spectroscopically and determine with high accuracy what gases are in its atmosphere. If we find the spectroscopic signature of oxygen, we will have the first solid evidence that life exists outside our solar system. These new telescopes I mentioned should allow us to make these sorts of measurements within the next ten years. This is a very, very exciting time to live in. Stay tuned to your science news feeds. Turning to the cultural side, Earth is also unique, in that it's the only planet not named after a classical god. There are, however, plenty of Earth gods from various mythologies. The Ancient Greek goddess of the Earth is Gaia, a name now also used in modern parlance to refer to the Earth and its living ecosystem as a single ecological entity thanks to the 1979 Gaia hypothesis of James Lovelock. The Roman equivalent was Terra, which may be familiar from words of Latin origin such as terracotta (baked earth), or as the name used to refer poetically to Earth in several science fiction works. Ancient cultures naturally considered the Earth as a prime candidate for godhood, often as one of the most important gods along with the sun and the sky. Earth, after all, fills the other half of our existence that is not covered by sky, so is pretty important. Frequently, the Earth is seen as a female deity, matched to a male sky or sun god. The Earth came to be seen as nurturing, a giver of life—which is surprisingly close to literally true—and hence as a mother figure. We still speak of Mother Earth. Earth was also considered to be one of the four classical elements which, along with water, air, and fire, constituted all matter. We've already seen that this notion is false, but the four elements remain powerful as symbols, representing not merely elements, but also states of being, and even temperaments. The heavens were thought to be made of a fifth element, or quintessence, not to be found down here in the earthly realms. And so again there is the historical notion that the Earth is fundamentally different from the other planets. 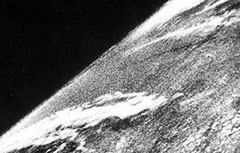 The first photo ever taken of Earth from space, V-2 rocket, 1946. Public domain image from Wikimedia Commons. Moving back to more modern and external concerns, there is another strange feature of our planet. Its moon. Our moon is unusually large for a planet so small. It is a full quarter of the diameter of Earth, making it the largest moon in the solar system in proportion to its planet. Its origin is still somewhat mysterious, as it's unlikely to have formed as it is around the Earth during the coalescence of our planet from the protoplanetary disc that swirled around our infant Sun. If Earth sized planets regularly formed large moons in this way, we might expect that Venus would have one, but it has no moons whatsoever. When I was a kid, there was this wacky and controversial theory around that the moon had been ripped out of the Earth by the gravitational pull of another passing protoplanet, leaving a gaping hole which later became the Pacific Ocean. While the ripping and leaving an ocean-sized hole parts are now seen as unlikely, the favoured theory of our moon's formation is that it was blasted out of the Earth by a huge collision with another body, early in the formation of the solar system, when the planets were still hot and being bombarded regularly with leftover debris from the early disc of material around the young Sun. This didn't leave a hole in Earth that needed filling with an ocean, as the planet was hot enough to flow back into a spherical shape, as was the debris flung off to form the moon. Each body later solidified and then had an independent geological (or seleneological, if you want to be picky about the Greek roots) history. Another unique thing about Earth is that, for most of human history, we couldn't observe it as an astronomical object. We are simply too close to it. We can't see the forest for the trees. We can observe the phases of Venus, we can get a view of entire giant storm systems on Jupiter, we can see the shapes of mountain ranges and enormous valleys on Mars as if looking down on a map. On Earth we're lucky if we can see to the next hill. We were unable to get an aerial view of anything on Earth until Jean-François Pilâtre de Rozier and François Laurent d'Arlandes took flight in the first manned hot air balloon (built by the Montgolfier brothers) in 1783. And we couldn't see our own planet as it appeared from space until photos taken by American experiments with captured Nazi V-2 rockets after World War II in 1946. The Blue Marble. Public domain image from Wikimedia Commons. In 1972, one of the astronauts on board the Apollo 17 mission to the moon took one of the most famous photographs in history. It's called The Blue Marble, and it shows the Earth as it really is, as a planet, adrift in space. This view of our planet made us conscious, collectively, of the fact that we share a small place in the universe. That the Earth is special not because it is the centre of the universe, nor because it's mythologically significant, nor because it has a big moon. It's special because it's home. In 1990, another photo of Earth was taken from space, this time by NASA's Voyager 1 deep space probe. The Voyager mission consisted of two probes, launched in 1977, to explore the outer planets of our solar system. The mission was one of the most spectacular and successful epics of exploration ever undertaken. Considered in terms of what we knew about planets, the Voyagers more than doubled the entire knowledge of humanity. After Voyager 1's encounter with Saturn in 1980, it had comparatively little left to do; its primary mission had been accomplished with stunning success. Carl Sagan, as a member of the Voyager science team, suggested the probe be turned around so it could take a photo of Earth. This would be a unique perspective, since there were no photos of Earth taken from so far away. But others on the team argued that there was no science value to such a photo, and that it risked destroying Voyager 1's camera, since Earth from that perspective would necessarily be close to the immense brightness of the Sun. For ten more years Voyager 1 drifted further out into space, passing the orbits of Neptune and Pluto. NASA Administrator and two-time Space Shuttle pilot/commander Richard Truly stepped in and decided the picture should be taken. And so, from the inky blackness of space beyond all the planets, Voyager 1 received the radioed order to turn around and cast an eye home. Voyager 1 took photos of Venus, Earth, Mars, Jupiter, Saturn, Neptune, and Uranus from this position. Assembled into a mosaic with a series of other photos showing the space between the planets, they form what is called the Family Portrait photo. A photo of our solar system, from outside. The photo showing Earth contains a few streaks caused by light from the Sun scattering inside the camera optics - a lens flare. Inside one of the flare streaks is a tiny dot, just one pixel. 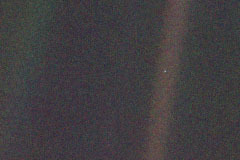 Earth itself from the distance of Voyager 1 would have had a size equivalent to about a tenth of a pixel of its camera. The light from Earth was detected by that one pixel, and rendered as a pale blue dot on the photo. This is the photo of Earth taken from the furthest distance from which this has ever been done. It shows our planet, our home, as an insignificant speck against the immense vastness of space. Every human being, everything else alive on Earth, lives inside one pixel of a photo from Voyager 1's camera. Pale Blue Dot, detail. Public domain image from Wikimedia Commons. The Earth is a very small stage in a vast cosmic arena. Think of the rivers of blood spilled by all those generals and emperors so that in glory and triumph they could become the momentary masters of a fraction of a dot. Think of the endless cruelties visited by the inhabitants of one corner of this pixel on the scarcely distinguishable inhabitants of some other corner. How frequent their misunderstandings, how eager they are to kill one another, how fervent their hatreds. Our posturings, our imagined self-importance, the delusion that we have some privileged position in the universe, are challenged by this point of pale light. Our planet is a lonely speck in the great enveloping cosmic dark. In our obscurity - in all this vastness - there is no hint that help will come from elsewhere to save us from ourselves. The Earth is the only world known, so far, to harbor life. There is nowhere else, at least in the near future, to which our species could migrate. Visit, yes. Settle, not yet. Like it or not, for the moment, the Earth is where we make our stand. It has been said that astronomy is a humbling and character-building experience. There is perhaps no better demonstration of the folly of human conceits than this distant image of our tiny world. To me, it underscores our responsibility to deal more kindly with one another and to preserve and cherish the pale blue dot, the only home we've ever known. I can say this accurately now that Pluto is no longer regarded as a planet. And still is. The Voyagers are still sending data back to Earth as they fly outwards to the stars. They are the furthest human-made objects from Earth, and are now probing the region of space where our Sun's solar wind is stopped by the very faint pressure of interstellar gas particles. The edge of our solar system. The Voyagers will soon be in interstellar space. Our first emissaries to the stars. Last Modified: Sunday, 19 January 2014; 00:09:48 PST.